Would you include info about your front seat brackets as well? I'm about at that stage of pimping my Spark EV. I knew right away that the stock wheels and tires were going to be a pain to improve on. The factory wheels are different width and offset from front to rear, and the factory tires are different sizes front to rear as well. There are probably a few reasons for this, but one of them is obviously because this narrow car really wasn't designed for tires this big. This car comes with 165/65R14 tires in most markets, so the 185/195 tires on the Spark EV are already pushing the limits. The factory took care of fender lips, so there really isn't any easy clearance to gain. I wanted a square setup so that I could rotate front and rear race tires around freely and have matching wheels all around, that was my base requirement as I started figuring out what could fit. I measured and tested and measured and tested until I finally committed to some wheels. The class I had in mind (SCCA STF) allows up to 225 tires on a 7.5" wheel, but it became obvious that wasn't even feasible when I tried test fitting those sizes. Eventually, I bought some Desmond Regamaster Evo Bright 15x6.5 ET45 wheels (say that fast 3 times!) from a guy in Hong Kong. That was an adventure on a few fronts, but I'm really pleased with the wheels. These things are LIGHT at only 8.5 pounds each. That's about 10 pounds of rotating, unsprung weight lost at each corner compared to the factory wheels! I tested the BFG Rival 205/50R15s and surprisingly, they actually fit! It's not all unicorns and rainbows in Spark EV land, unfortunately, as the wheels required some caliper "massaging" and some 5mm spacers up front to clear the wheels spokes. The Spark EV bolt pattern is the extremely common 4x100, but the hub center bore is just a touch larger than the typical Honda (56.5 mm vs. 56.1 mm). I bought some of the common 56.1 spacers and kissed the ID with a dremel to make the wheel spacers fit the hubs. I think that wheels with the same width and offset but with wheel spokes that have more curve to them would be a better fit, avoiding the caliper clearancing but still requiring the spacers. In the first event with the tires and wheels in the front, I had some really minor rubbing and raised the front suspension 10mm, afterwards no rubbing. Considering how narrow the car is and how tight the wheel and tire fitment is from the factory, that's all the tire I can get away with. Last year I bought some 195/50R15 Hankook Ventus RS3 (Version 2) since they seemed to be the best 200+ treadwear tire that I could fit (required for STF). Since then there are some better performers in the 200+ category since I got the RS3 V2, I might trade some increased performance for some minor rubbing when I get my next set of tires and go back to a 205. The improved wheels and tires really transform the car. With good tires and lighter wheels, the 0-60 times are drastically improved and the car is just all around better to drive, as you'd expect. Great thread! I'm new to the Spark EV world but I come from the Porsche community so I'll all about performance modifications. That said my Spark is leased so I don't want to get too carried away. The though of swapping out the wheels to reduce unsprung weight certainly has crossed my mind. I've read conflicting reports about the exact specs of the OEM wheels (diameter, widths, offsets & weights). Since you clearly know your way around these factors, would you mind sharing what you've learned about the OEM wheels? It occurs to me that we might be able to learn a thing or two from the Miata community since the early model Miatas (1989-2005 NA/NB) used the same 4x100 bolt pattern. I know the Miata guys are all about weight savings and autocross! One more request a DIY guide with photos of removing the rear seats would be interesting to see. Unfortunately for me, I have to put my car up for sale because I've taken a job in Europe and can't bring it with me. Fortunately for you, the coolest Spark EV in the world could now be yours! Any more tips for the community, from your wealth of Spark EV modding experience, Bryce? The long anticipated rear-seat delete instructions, perhaps? This is what it looks like removed. It fits *perfectly* through the rear side doors. Just slide the front seats forward, then tilt it and slide it out the door opening. 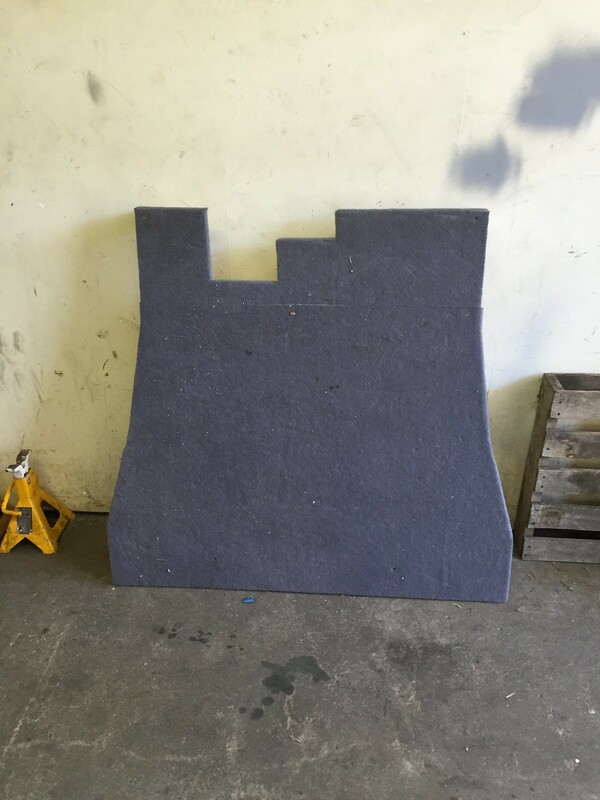 You can see a seam in the carpet near the top (the rear of the car) because I couldn't find any appropriate carpet that was big enough at the car parts store the day I made it. Since then, I've seen that Lowe's has some small rolls of indoor/outdoor carpet that look similar and come in larger sizes (avoiding the seam) and would have been cheaper to boot. The end result is a significant increase in interior storage volume. More importantly for me, it created several inches more headroom for my big dog, which meant he wasn't rubbing on the headliner when he wanted to get some fresh air. It also created a flat platform, which was very handy for his dog bed or just regular using-a-hatchback-like-a-pickup activities. It was definitely louder than the stock configuration. I thought about tossing a bunch of polyfill or similar underneath of it, but the point of this design was to be cheap and extremely easy to install and remove. 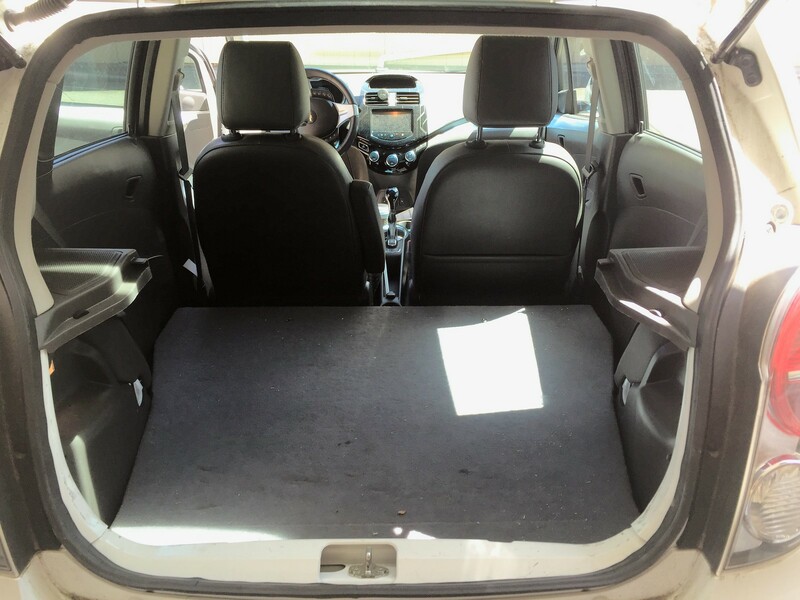 As a side benefit, it also sheds about 30 pounds compared to the rear seats alone. 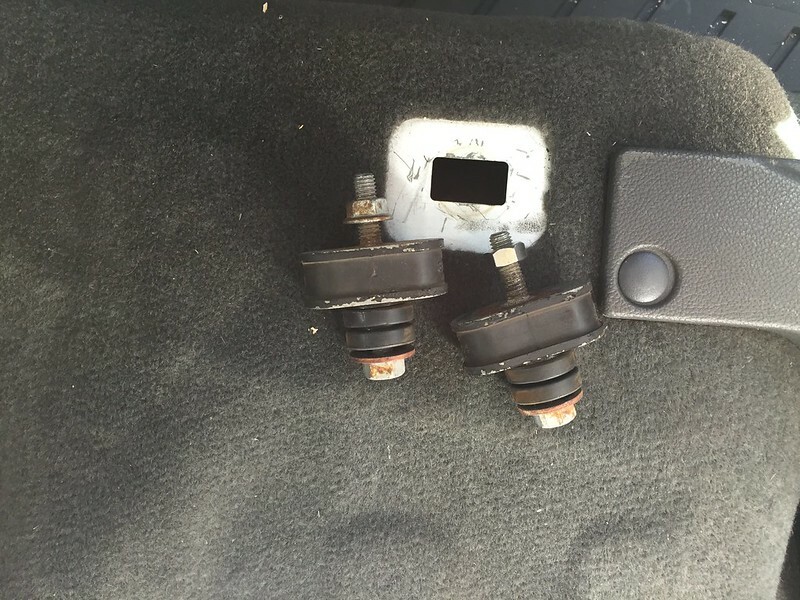 This completely flat setup requires unbolting the rear seat bracket, which has four bolts (one torx, three hex). Unfortunately, the seat bracket sits a few inches higher than this deck height, and since the lowest load floor possible was my goal I opted to remove the bracket each time I installed the cargo shelf. If you just wanted a flat floor and didn't care about the maximum vertical space, you could leave the seat bracket in and just have the shelf a few inches higher. You could also slot the plywood and have the bracket stick above the flat floor if you didn't mind the protrusion. If you guys want to try and replicate it, I'd ask that you start another thread just for the rear seat delete topic. Last edited by Nashco on Sun Aug 07, 2016 2:09 am, edited 2 times in total. I never did install the race seat. I had bought Planted universal brackets from 425 Motorsports and hacked up some gas Spark seat tracks (removed from a junkyard seat) to adapt the race seat to the Spark floor pan. It ended up being more work than I had hoped for in the end, but worked. The big reason it wasn't "finished" is because I didn't even get the first step on installing a proper race harness. There's no point in using a race seat with stock shoulder harness! There wasn't an immediately easy solution that I could just order up XYZ parts, and I haven't had time to go racing the last several months, so that's when the project hit a wall. Nashco wrote: I bought some Desmond Regamaster Evo Bright 15x6.5 ET45 wheels (say that fast 3 times!) from a guy in Hong Kong. I tested the BFG Rival 205/50R15s and surprisingly, they actually fit! In the first event with the tires and wheels in the front, I had some really minor rubbing and raised the front suspension 10mm, afterwards no rubbing. I found some of those nice light wheels on eBay, but I don't want to pay that much for them. So, with the car at stock ride height, 205/50 don't rub at all? And how much spacer do I need to put stock rears on the front with new brake pads, 4mm, 5mm? Click here for a cheaper set of the same wheels that are currently on ebay. Note that I didn't say they were cheap! I suspect you could go a little bit taller than stock tire sizes if you go narrower without any issues. You might have minor rubbing on the inner wheel wells if you don't go narrow enough, but nothing major. You can put the rear TIRES (or same size tires as the rears) on the front WHEELS and not have any issues. However, you can't put the rear wheels on the front, if that's what you're asking. If you tried that, the wheel spacer required would be so thick that your wheel studs wouldn't be long enough. To replace the wheel studs means replacing the front hub bearings if you follow GM service instructions, so it gets to be a real PITA. Nashco wrote: However, you can't put the rear wheels on the front, if that's what you're asking. If you tried that, the wheel spacer required would be so thick that your wheel studs wouldn't be long enough. To replace the wheel studs means replacing the front hub bearings if you follow GM service instructions, so it gets to be a real PITA. Rats, that's what I was asking. Do you know how thick? Is it the same as the 9mm difference in offset? Used Spark wheels are widely available, Interchange lists them as 6.5" and fitting rear Spark EV and all four on gas Spark. I actually found some EV fronts here in Michigan, if they're listed correctly, but the price on them is twice as much as the rears. For the cost difference in the 'winter wheels', I'd be willing to buy 8 studs and press them in/out and make sure I have nuts that will work with the summer front wheels, but if the studs can't be replaced in situ, that's a problem. Maybe I should just call up the place listing the Spark EV front wheels, verify the part number, and then offer to trade them straight up for a pair of Spark wheels, because there are maybe 3 cars in Michigan that their wheels fit? I would guess about 13-15mm of spacers would be needed to install rear Spark EV wheels on the front, but that would leave no thread engagement and lead to certain destruction. As I said, you would have to install longer wheel studs and that means 8 studs plus two bearings plus time and hassle...all of the sudden, the extra few bucks for some wheels that fit better or slightly narrower wheels doesn't sound so bad!